Expect the unexpected. When the unexpected happens, there is no do-over. There is no reset button to push. Remember, You Only Get a Mulligan in Golf. You knew that already. So why am I telling you this? Well, while you may know this, have you really thought about its implications? Let’s review a few recent examples of uncertainty. First, in mid-2016 Britain voting to leave the European Union (“EU”) was a surprise. This was known as Britain Exiting the EU and was coined as “Brexit.” Britain joined the EU in 1973. Interesting enough, Britain retained its currency the pound sterling and did not adopt the currency used by the rest of the EU, the Euro. How and when Britain manages to remove itself from the EU remains to be seen. What is clear is that it will likely be expensive and possibly very messy. The concern for the EU is, what is the next county that wants to leave the Union? Will it be France (“Frexit”) or perhaps the Netherlands (“Nexit”)? Second, another unexpected development was the election of Donald Trump as President of the United States. The pollsters certainly got this one wrong. Evidently voters weren’t exactly forthcoming when they were being polled prior to the election. Apparently, a fair amount of folks didn’t want to admit they were going to vote for him. Um, do you wonder why that is? Oh, never mind. Last, but certainly not least, perhaps the biggest surprise was that the Chicago Cubs won the World Series in 2016. The last time the Cubs won the World Series was in 1908, a mere 108 years ago! These three very unexpected events occurred less than six months apart. There will be more of these types of events. There always is. There always will be. We just don’t know what it will be. Or when it will happen. 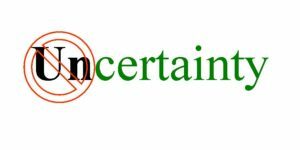 Remember, there is always a certainty of the uncertainty. Donald Rumsfeld, Secretary of Defense while serving President George W. Bush said, “As we know, there are known knowns; there are things we know we know. We also know there are known unknows; that is to say we know there are some things we do not know. But there are also unknown unknows-the ones we don’t know we don’t know.” 1) Well said Rummy. Pay yourself first. How many times have you heard this? Far too many I suspect. It clearly is an Old Saw. Don’t let anyone tell you It’s Not About The Money. The fact though is you do need to Pay Yourself First! Otherwise there is nothing else to talk about. Any financial uncertainty will be dealt with one way or the other. If you haven’t been paying yourself first it likely won’t be dealt with well. Paying yourself first is all about personal responsibility. Hopefully by now you have addressed this already. If not, here is your gentle nudge. The easiest way to pay yourself first is to participate in your employer’s 401(k) plan at work. The 401(k) plan will be the cornerstone for many employee’s retirement plan. Self-employed individuals will need to adopt their own retirement plan. This could be funding IRA’s, Roth IRA’s or perhaps a Self-Employed Retirement Plan (“SEP”). Please, don’t over think this. When your contributions to your retirement plan are being taken out of your paycheck, this is great. You can’t spend money you don’t have. Sorry, I should rephrase that. You shouldn’t spend money you don’t have. Of course, you can. Run into Tiffany and get that nice Rolex you have had your eye on for the last six months. But wait, you don’t have any cash. No worries. Put it on your Gold Card. Get the points. You can pay for it next month. Or the month after that. Or whenever. Then buy that brand-new John Deere Tractor from Home Depot just like your next-door neighbor got last month. Who says you can’t keep up with the Joneses? Oh and no payments for six months. Then you got a zero percent interest loan for thirty-six months. Sweet. Then sign that lease for that spanking fire engine red BMW 525. It’s only $2,000 down. Life is good! You get the idea. You CAN spend money don’t have. It’s just that you shouldn’t. The Great Recession of 2008-2009 sent this message home in spades. It did more than knock over a lot of white picket fences in many folk’s front yard. Hopefully lessons learned here. It’s important to know The Difference Between Good Debt and Bad Debt. A lot of coaches of sports teams will tell you the same thing, “Defense wins championships.” The same can be applied to your financial planning. Defense with your financial planning means protecting what you have. Winning championships with your financial planning means getting to the financial promised land. Here on earth. Playing defense is also known as risk management. Risk management is also known as insurance. Most folks don’t want to read about insurance. Much less about buying more insurance. Again, don’t over think this. If you have a mortgage on your home, the bank that made the loan will require homeowner’s insurance. This is a good thing. If your home were to go up in flames and you didn’t have homeowner’s insurance all you would have is a piece of land, a foundation and mess on your hands. No one is mandating that you need any other insurance. But that doesn’t mean that you don’t need to have some. If you have dependents, you will likely need life insurance. Dependents are minor children, maybe your spouse and perhaps other relatives that are dependent on you. The death benefit from the life insurance policy would be used by your dependents to maintain a similar lifestyle if you passed away. Term insurance premiums are VERY reasonable. Most folks should also look at disability insurance also. These premiums however could be expensive. First check to see if your employer offers disability insurance. It’s important to understand if this it is short-term disability or long-term disability. Another type of insurance that everyone should take a hard look at is a Personal Umbrella Policy. This coverage acts as a backstop to your auto and homeowner’s policies. It will kick in if the claims exceed the policy coverage of the other policies. Like term insurance, the premiums for an umbrella policy are very inexpensive. Here is Why Everyone Needs a $1 Million Umbrella Policy (or More). Before you start investing you have got to bring in the cash reserves. You will need to set aside money for the proverbial rainy day into your cash reserve fund. These funds won’t be invested. They need to be in cash in a bank account. When you need access to them you will need it quickly. Noticed I said when. Not if. You will need to access these funds at some point. You don’t know when. You also don’t know exactly what you will need these funds for at this time. Perhaps your car breaks down. Maybe you get some unexpected medical bills. You roof starts leaking. You get the idea. Stuff happens. That’s why you need to maintain an adequate cash reserve fund. Most commentators suggest maintaining six months of living expenses in your cash reserve fund. If you can do this, great. If not, do what you can. Start with one month and go from there over time. Most folks, except perhaps Warren Buffet, Chairman and CEO of Berkshire Hathaway, don’t invest just for the fun of it. They invest because they have goals. These goals could be to plan for retirement, children’s education or perhaps just getting a new car. These goals will have timelines associated with them. Even if the timelines are somewhat fluid. Get used to that word, fluid. It’s not the Merriam-Webster definition but it means things change. And change, along with uncertainty is all we can count on. People in their twenties and thirties have a huge advantage over guys like me, the fifty something crowd. In a word, it’s time. Younger people that make some simple and prudent decisions can impact their financial future in such a positive way. These decisions aren’t easy and require some discipline. Conversely, poor decisions or just not paying attention will lead to a more difficult financial future. A younger investor punishes themselves if they don’t start saving at an early age. The punishment might not show up for many years, but when it comes it can be harsh. This punishment could mean retiring later than planned, not getting that beach house or not leaving a legacy for your heirs and favorite charities. Remember, even small amounts of money invested regularly will add up over time. Start saving early and let compounding work its magic. Can an investor be successful using a market timing system? Perhaps. It’s just the odds are stacked against investors using these systems. Remember, you don’t necessarily invest to get the highest rate of return. You invest to achieve your financial goals. And investing, after all, is a function of dealing with probabilities. Why invest like this when the probabilities are against you? You’ll have to be right twice. The first time is trying to sell at the top of the market and the second time is buying back in at the bottom. Want to increase the probability of success? Trade less and invest for the long run. Have a plan and stick with it. If there was a market timing system that worked, why would anyone want to share it with you? You will, and trust agreement if you have one, will direct who gets your stuff and when. The Power of Attorney will allow someone else to act on your behalf if you become incapacitated. The Health Care Proxy will allow someone to make end of life decisions on your behalf. If you want or need a trust agreement it may be part of your will or perhaps a separate agreement. Work with your estate planning attorney to get this documents executed. Then revisit them every three years. Why? Everything changes. Your estate planning documents need to reflect this. Here are the Estate Planning Lessons Learned From My Moms Estate. Opinions expressed in this article are those of the author and not necessarily those of Raymond James. All opinions are as of this date and are subject to change without notice. Past performance may not be indicative of future results.